Artificial intelligence has been a buzzword in the business world for the past several years. And ever since Watson won Jeopardy! in 2011, AI has become ingrained in the public eye as not just a futuristic dream, but a grounded reality. It's been promised that AI will change everyone's work — and it seems that even artists will be affected. This past week, Gizmodo reported that the Allen Institute for Artificial Intelligence has successfully trained an AI to automatically generate Flinstones clips. The process began with feeding the AI over 25,000 three-second clips of The Flintstones. Researchers then described each clip with detailed descriptions of the character, where they were, and what they were doing. 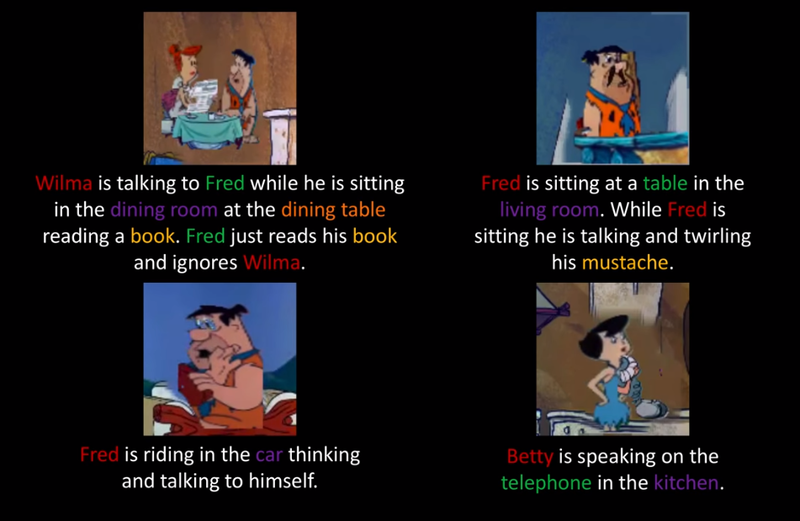 After all this data had been indexed, they then began to ask the AI to generate clips based on various requests; for example, they fed it the line "Betty is speaking on the phone in the kitchen." The program proceeded to generate a clip, based on the footage it had available, to composite a moving image. It's worth watching the Allen Institute's video about their project. To see an AI come this far is astonishing, to say the least. It might also spark worry about future job prospects... but it doesn't seem too likely that the AI poses any immediate threat. First of all, as can be seen in the video, the program fails often. Items are not placed correctly, and poses or backgrounds are not retrieved accurately. That's not even looking at the "catastrophic failures" which end up unintelligible. However, the successful clips are rarely much better. Sure they show what's being asked for, but the quality feels more reminiscent of an amateur DVD-rip, with artifacts all over the place. Perhaps the most pressing setback for the AI at this time, though, is that it requires existing assets to function. Without being fed clips, the program cannot work. Some artists have to make those clips in the first place. Plus, cataloging all those clips takes an extensive amount of manpower. For twenty-five thousand clips, let's say each is described with seven words: "Fred running across kitchen in his pajamas." If that's the average description length, then they'll reach the same word count as Tolkien's The Fellowship of the Ring. Now automatically generated animation is not particularly new; GoAnimate has been available for years now. However, GoAnimate relies on pre-programmed animations that the user can then choose to string together. Not everything that a user wants will be available. The Allen Institute's project has gone one step further, in trying to combine assets itself in a more nuanced way. Obviously it still has a ways to go, but it's a step forward. It's worth keeping an eye on though. It may, in due time, become a valuable artistic tool.